Big Video Contest: Show Us Your Jalopnik, Win Fabulous Roush Prizes! After snagging some hot swag from today's 2010 Roush Mustang reveal, we figure it's time for another contest. 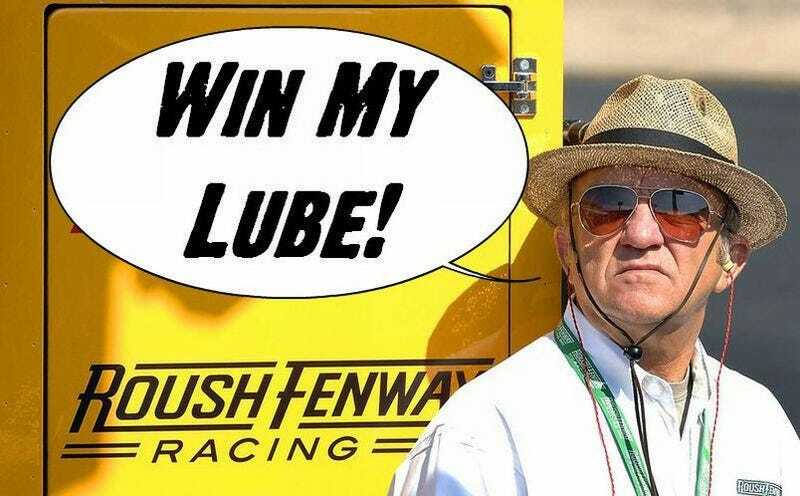 Below, how to win some Jack Roush-signed paraphernalia and what you need do to earn it. The Concept: Film a two-minute or less short about why you're the most Jalopnik of them all. We'll be running a few of these contests as we've got a sizable stockpile of goodies to go around, so we'll keep this one hugely open-ended. Do whatever you like: Show us your car. Show us your pile of vintage. Keep it light, keep it interesting. Hoonage is highly regarded, but we're not responsible for any pain or damage you bring upon yourself. The Prize: One quart of official Roush Full Synthetic engine oil signed by Jack Roush! Winners will get their choice of tasty 5W-20 or 5W-30 weight oil, Sharpie-signed by the short, hatted racer himself. You can't buy this kind of merch, folks. Sit this shiny silver quart on your speedshop's shelf in pride as it unleashes the fury and precision of American craftsmanship onto all that you build under it's watchful eye. We'll also publicly declare the winner with an article featuring their video, so fame and glory is definitely on the table. After we run three video contests, we're likely to have a championship competition between the three winners; so think of this as edging your way into the semi-finals. The Rules: Standard contest rules apply. If you're posting straight to YouTube, make sure to include your Jalopnik username in the description, or we won't know who we're giving the prize. We reserve the right to use your likeness in all posted videos and may post them to our site at anytime. After we announce a winner, the prize will be shipped cheapest possible option straight to a continental address of your choosing. Don't discount the carrier pigeon choice - those guys work cheap. Get out there, have at it. Happy filming!